Jessica is not accepting new clients at this time. "I love hair. Always have. Going through my personal photo album there are countless pictures of me playing with hair, styling hair, colouring it and "modeling" pictures of my creations, from my early teen years on. Many a good (and trusting) friend let me do their hair long before I knew what I was doing." Jessica finished at the top of her class from the Malaspina Hairdressing Program in Nanaimo in 2004 and hasn't stopped since. Immediately following graduation she opened her own business and worked out of a salon in Qualicum Beach for four years. From there she moved her skills to her own full-service salon in beside her house in the beautiful oceanside community of Parksville, close to the downtown shopping core. 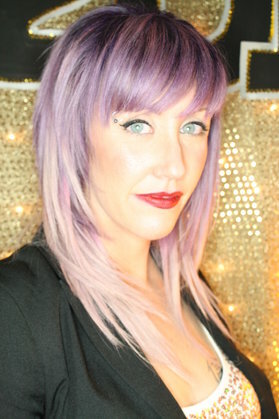 Jessica's love of hair and styling has included promoting quality education for future stylists; since 2010 she has done Product Knowledge classes for the Joico line she uses in her salon, and since 2005 she has worked at the Vancouver Island University Hairdressing Program as a Lecturer, Relief Instructor and, in 2012, as a full-time Instructor. While she found teaching new students an exciting and inspiring experience, and has been proud to help many aspiring stylists begin their own careers, Jessica decided to return focus to her first love, being back behind the chair at her own salon in 2013. 2015 saw the return of the Red Seal certification for the Hairdressing Industry in British Columbia and Jessica jumped at the opportunity to be one of the first certified for this Nationally recognized achievement. She is excited to now be working with the Industry Training Authority (ITA) to see more stylists succeed in achieving their Red Seals in British Columbia and hopes to see it become a requirement in the Province in the not-too-distant future. Jessica is constantly pushing herself to learn more, updating her techniques and skill level through advanced education classes and expanding her salon-resource library. You'll be in good hands. Just ask any of her extensive clientele and they are bound to share that she is a stylist that really listens and, best of all, truly cares. Jessica wants to get your hair working for you, so what are you waiting for? "Jessica has been my stylist for many years now and I will never go to anyone else. She is the only person who truly listens to what I want, and at the same time isn't afraid to tell me that my hair simply won't do what I'm asking. Those two things are 2 characteristics of a really great, and true professional. I have never left her salon with less than a smile on my face, and a boost in self confidence. I would recommend her to anyone." "My testimonial is simple.....Many hairdressers listen for a moment and tell you what you want to hear. Sure you can go blonde right now, forget that you have had bottle black in your hair for 5 years. But not my Jessica. A true professional in a sea of mediocrity, Jessica tells you like it is, and gives you the cut, color and recreation you wanted, but with your personal hair type and lifestyle in mind. And cutting edge? Lest we forget her state of the art imagery and vision where future and present trends are concerned. If doctorates in Hair were available, Jessica would have earned the first one!" "I am an older client and love the fact that Jessica doesn't try to give me an old lady's haircut. I'm not too adventurous with my hair but if I was going to let anybody try "something different" it would be Jessica. She is very artistic in everything she does and I trust her not to send me away looking foolish. She is fun which makes the time spent with her a happy time." Follow Me On Instagram - click the camera and then click 'follow' to see more pictures! A Proud Member of Green Circle Salons! Jessica is proud to have been the first salon in the Parksville area to partner with Green Circle Salons who are committed to making beauty sustainable! As of September 1st, 2013 a $1.50 Eco Fee will be included with all service pricing!